A British perspective on America at the close of the American Revolutionary War. A New Map of the British Empire in Nth. America. 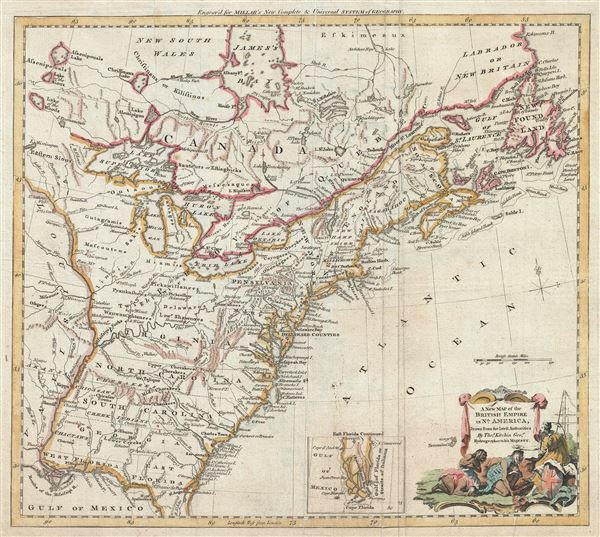 This map was published by John Hinton for the October of 1776 edition of the Universal Magazine of Knowledge and Pleasure. Though no cartographer is named, it is highly likely this map was drawn and engraved by Thomas Kitchin, a known engraver for the Universal Magazine with whose distinctive style this map is consistent. Millar, G., The New Complete and Universal System of Geography, (London) 1782. Very good. Some wear on original fold lines. Backed with archival tissue. McCorkle, B. B, New England in Early Printed Maps 1513 - 1800, #782.10. Sellers, John R. and Van Ee, Patricia, Maps and Charts of North America, no. 180. Reed College Hauser Library Special Collections and Archives G3300 1782 .K5.